Advertising through social media provides a personal experience for customers in a way that search cannot offer. This is done through more advanced targeting options by going beyond keywords to a targeted audience based on the information people share on their Facebook page such as location, interests or job title. With the number of people using social media channels increasing every day, is it any wonder so many companies have taken to social media to reach their customers. There are around 1.4 billion users on Facebook, and they all have the potential to view your ad! 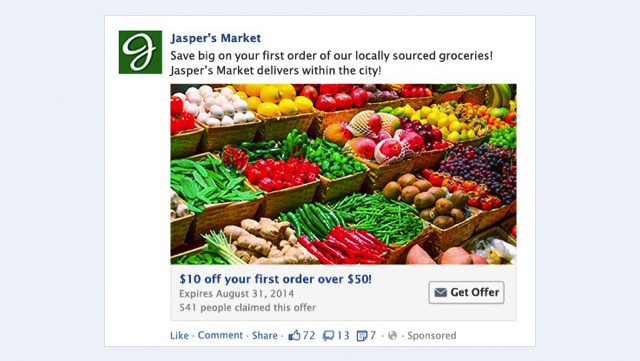 To create an ad simply click ‘create an ad’ in the drop down at the top right hand corner of your Facebook news feed. In order to get the most out of your campaign it is important to go in with established goals. This is true for all channels but especially Facebook where there are a range of advertising methods for different objectives. These include offer claims, website clicks, event responses, app installations and many more. All of these are useful in their own right but it is important that you pick the right one for your campaign. Knowing exactly what you want to get out of your social campaign will help you pick the right objective. As there is such a large number of Facebook, users you need to ensure you are targeting the right ones. 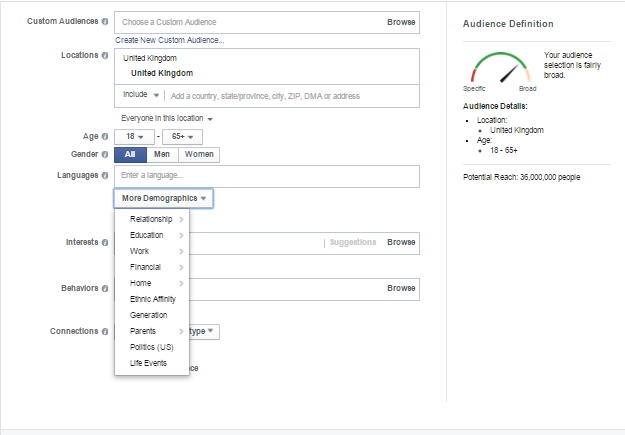 Facebook advertising has a large amount of targeting options to make sure your ad is showing to the right people. You can target based on location, age, gender, languages, education, job role and more to allow you to reach the right segment of the market for what you are offering. You can choose to go for very specific targeting to reach a particular niche of the market to get a high click through and conversion rate or opt to go for a much broader campaign generating awareness and lots of impressions. You can set a daily budget or a lifetime budget to your campaign so that you have strong control on your costs and only spending what you can afford. Just like with search, you will need to set bids for your ads, which are your desired maximum price for the outcome you are optimizing for (e.g app installs, post engagement etc). 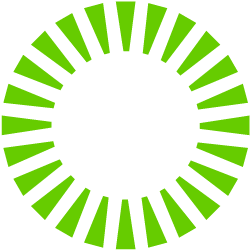 You can keep track of all your costs in performance tracking interface so you know what your ads are spending and you can increase or decrease you bids and budget at any time. There will be more options for you to choose from along the way, such as ad scheduling and delivery type for your ads. These will all add to the targeting of your ads and ensure you are reaching the right people at the right time and getting the most out of your campaign as possible. Use performance tracking to monitor how well your ads are performing and know exactly what you are spending and where you are spending it. 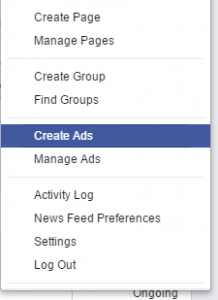 You can check your ads performance on the Facebook ads interface. Your ads performance can be judged by looking at the impressions and how many clicks it has generated. You can then compare you ads to see how they are performing against each other to try to get an idea what it is your customers want. You can use this information to improve the campaign and create better ones in the future. Facebook allows for customer engagement, in a way that search cannot match, through page likes, post likes, shares and comments. This customer engagement can help to increase the success of your campaign by boosting your ads to increase web traffic and brand awareness as well as creating a better advertising experience for the user. You are able to monitor all these engagements in performance tracking and use this information to help compare ads performance. Despite its increasing popularity, many businesses still aren’t using Facebook advertising, so it is an opportunity for you to get ahead of competitors and target current and potential customers in a way that they are not already being targeted. -Facebook advertising won’t necessarily be suitable for all businesses and sectors so proceed with caution. Remember that clicks aren’t conversions, so be sure to know what you are spending and don’t spend money needlessly without seeing any return on investment. -Be sure to check back on your campaigns performance and optimise it regularly, which will require time and effort but ensuring your ad is the best it can possibly be will increase clicks and conversions, so it will be time well spent. 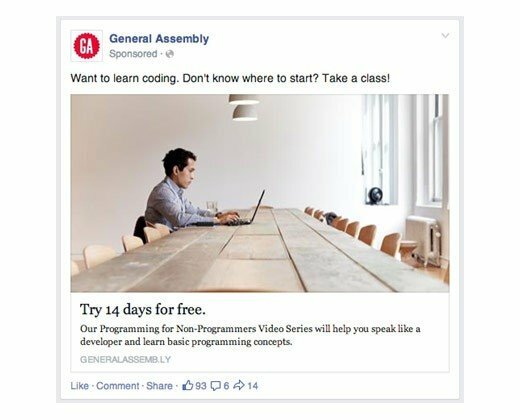 -Lastly be careful not to overfill Facebook with ads for your company. Users will find ads getting tiresome and annoying and it could end up destroying your brands image and reducing clicks. Find the right balance and ensure ads are up to date and well spread out to provide customers with information they will be interested in.